A Poster of the Temple Institute's model of The Ark of the Covenant. 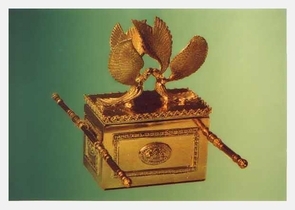 The Ark of the Covenant ( in Hebrew: aron hab'rit) is described in the Bible as a Sacred container, where the Ten Commandments tablets were as well as other sacred pieces. According to the Biblical account, the Ark was built at the command of God, in accord with Moses' prophetic vision on Mount Sinai The Ark of the Covenant is the best renowned for its mysterious powers against the enemies of Israel. The Ark of the Covenant resided in the Holy of Holies, the innermost room of the Tabernacle. Access was only allowed one time a year, on the Day of Atonement and was restricted to one person - the High Priest. He had to come into the Holy of Holies with the blood of a goat, on behalf of his own and the people of Israel's sins. The Ark was a small box made of wood and overlaid with gold. Its size was 1.15 meters long, 0.7 meters wide and 0.7 meters high. Doko Media looks forward to serving you, your family and your community. Our Bible Land journey is provided to you with our full customer service and shipping guarantee.